What are the EU SIF? What’s happening in the 2014-20 EU SIF programme and where do Local Enterprise Partnerships (LEPs) fit in? What is the role of LEPs in EU funding? What will LEPs invest in under the EU SIF 2014-20 programme? The local dimension – what are the allocations by LEP area? What’s happening now and when will the programme be open for applications? What you need to do to prepare for these opportunities? From January 2015 a new seven year cycle of European Structural & Investment Funds (EU SIF) programmes begins which is distributed through the UK Government. European Social Fund (ESF) which supports skills, enhancing access to employment and social inclusion. European Agricultural Fund for Rural Development (EAFRD) which supports economic development in our rural areas. European Maritime Fisheries Fund (EMFF) which helps fishermen in the transition to sustainable fishing, supports coastal communities in diversifying their economies, finances projects that create new jobs and improve quality of life along European coasts and makes it easier for applicants to access financing. 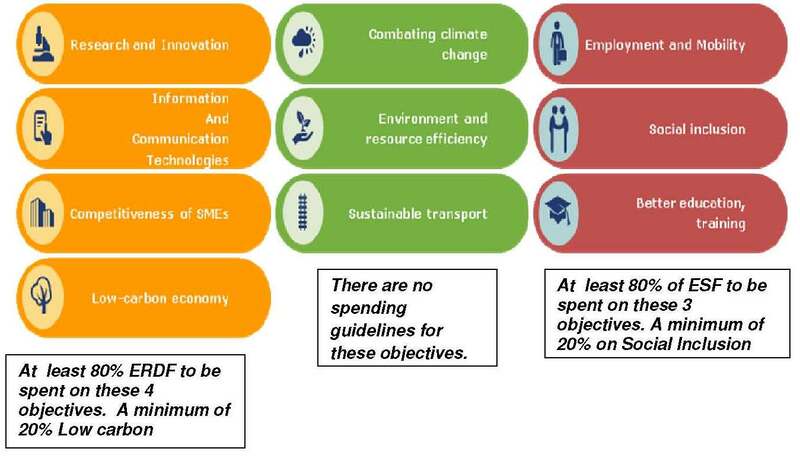 Link with EU 2020 Strategy - Europe 2020 is the EU’s overarching strategic aim for smart, sustainable and inclusive growth. This is underpinned by specific targets around employment rates, qualifications, poverty reduction etc that all EU Member States will be monitored against. The Structural Funds are seen as a key funding mechanism for Member States to work towards achieving the targets. Coordinated use of four European Structural & Investment Funds – the European Commission (EC) has created a new regulatory framework which is designed to make it easier for the four EU funds (ERDF, ESF, RDP and Fisheries) to be integrated more closely to deliver a better impact; prior to this the funds have been developed separately by different departments within the Commission. Target resources at key growth sectors - see the 10 thematic objectives below. Set clear objectives and measure results. Stronger role for partners in planning, implementation and control - the EC now requires Member States to have a Partnership Agreement in place for the EU SIF, which sets out what the programmes are aiming to achieve and why, and puts in place programme level indicators for the Member State. From 2014 LEPs will be the primary vehicles for developing investment strategies around a range of EU priorities. Each LEP area has been received a notional funding allocation for the full seven year period (see table below). Although LEPs will shape investment priorities and commissioning they will not hold or be accountable for EU funds. Funds will be held by Local Growth Teams derived from each of the EU fund managing authorities (Department for Work and Pensions (DWP), Department for Communities and Local Government (DCLG), Department for Business Innovation and Skills (BIS) and Department for Environment, Food and Rural Affairs (DEFRA). Consultation undertaken by BIS in early 2012 identified a number of EU thematic objectives that were of particular relevance and priority for the UK. These objectives are summarised below. Each LEP has written an investment strategy describing how they will spend their allocation of ERDF, ESF and EAFRD funding. These strategies are currently being finalised and should be finalised by end of September 2014. Derby and Derbyshire, Nottingham and Nottinghamshire (D2N2): Derbyshire & Nottinghamshire Counties including cities of Derby and Nottingham. Leicester and Leicestershire (LLEP): Leicestershire County and City. Greater Lincolnshire (GLLEP): Lincolnshire, North Lincolnshire and North East Lincolnshire. South East Midlands (SEMLEP): Bedfordshire, Buckinghamshire and Oxfordshire and boroughs / districts of Northampton, Kettering, Corby, South Northamptonshire and Daventry. Greater Cambridge-Greater Peterborough: including Rutland. Sheffield City Region (SCR): Sheffield economic area including the districts of Bassetlaw (Nottinghamshire) and Chesterfield, Bolsover, Derbyshire Dales and NE Derbyshire. There are some significant changes and new opportunities in the way the 2014-20 programme will be delivered, in comparison to the 2007-13 programme. Some of these changes and opportunities are focused around match funding and local community approaches. As with any European programme, there is a requirement to obtain 50 percent match funding. However there are some options that have been made available to LEPs from other Stakeholders such as the DWP, Skills Funding Agency (SFA) and the BIG Lottery fund where they are offering match funding against the EU priorities which align with their own programme priorities. There are different processes for this match funding opportunity and DWP, SFA and BIG have produced “prospectuses” that the LEPs can then sign up to if they choose to; LEPs have to indicate from the outset whether they wish to do this. Probably of greatest interest to the third sector is the BIG Lottery Fund match funding offer specifically for the Social Inclusion thematic objective. Government guidance to LEPs specifically asks them to use this opt-in for at least 50 percent of their social inclusion spend for the first two years, or to justify why not; BIG however “can accommodate more” and is pitching for greater commitments (more of their funds and for a longer term) from LEPs. Apart from this offer though, match funding is likely to be a significant issue, across all the thematic objectives, and organisations that want to submit project proposals in due course will have to resolve it. 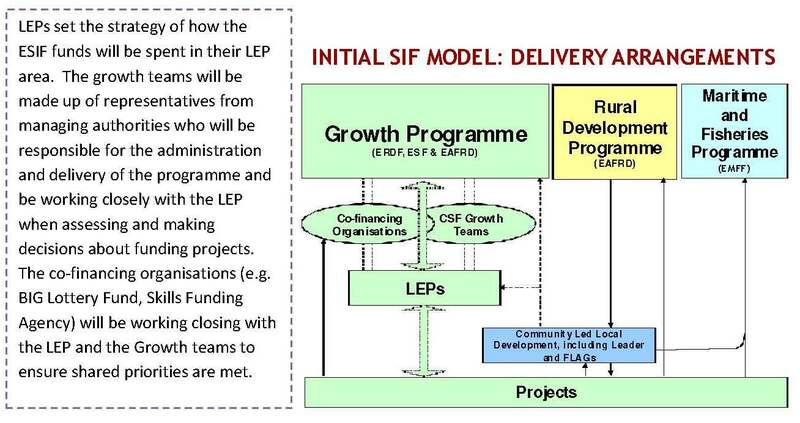 LEPs in their new role of strategic oversight of the 2014-20 programme will be expected to explore match fund opportunities from private, public sectors and other national funding programmes. Community-led local development (CLLD) is a tool for involving citizens at local level in developing responses to the social, environmental and economic challenges we face today. CLLD is an approach that requires time and effort, but for relatively small financial investments, it can have a marked impact on people’s lives and generate new ideas and the shared commitment for putting these into practice. The EC is keen to see take up of CLLD approaches in delivering inclusive socio-economic outcomes and enabling integration between the individual EU SIF streams. However, in England, LEPs will be able to choose whether or not they take advantage of this approach. CLLD is favoured by the EC as it builds community capacity and stimulates innovation (including social innovation), entrepreneurship and capacity for change by encouraging the development and discovery of untapped potential from within communities. Under the current guidance CLLD proposals need to be planned within the social inclusion thematic objective but can deliver activities and outcomes covering a range of other objectives including those for ERDF. All LEPs have been working to finalise their investment strategies for how they will spend their allocation of EU SIF money in their local area. The final drafts of their strategies should be completed by the end of 2014 and the fund is likely to open at early 2015. Between now and the end of 2014, there will a number of negotiations, decisions and discussions taking place to approve final investment strategies, opt-ins, operational plans for the new programme and develop mechanisms for how the administration of the fund will be delivered. Building relationships with partners across the voluntary, private and public sector and look at collaborative opportunities. To find out more about LEPs visit www.oneeastmidlands.org.uk/leps. To find out more about ERDF visit www.oneeastmidlands.org.uk/erdf. To find out more about the One East Midlands ERDF Reach & Impact Project visit www.oneeastmidlands.org.uk/reachandimpact. To sign up for the Reach & Impact e-bulletin email information@one-em.org.uk.